1. 48% of marketers build a new landing page for each marketing campaign. 2. 68% of B2B businesses use landing pages to garner a new sales lead for future conversion. 3. 16% of landing pages are free of navigation bars. 4. 48% of offers have multiple offers built in. 5. 42% of offer-related graphics on landing pages are not clickable. 6. The biggest challenge B2B marketers face in regards to lead generation is generating high-quality leads (61%). 7. 84% of companies that have a CRM have a lead scoring process in place to determine the quality of leads. 8. Content marketing generates 3 times as many leads as traditional outbound marketing, but costs 62% less. 9. 37% of B2B marketers are using marketing automation to generate leads. 10. 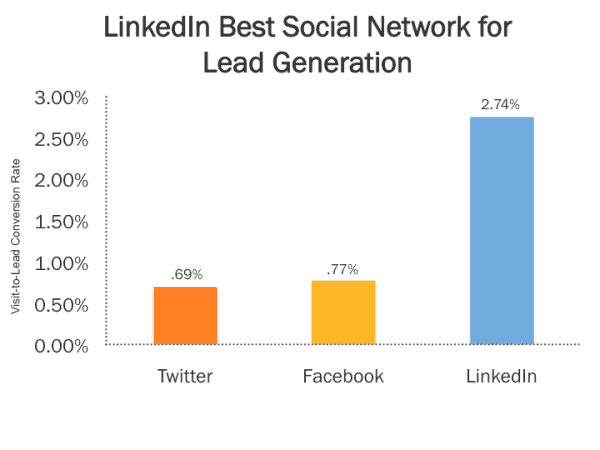 44% of B2B marketers have generated leads via LinkedIn, whereas only 39% have generated leads through Facebook and just 30% through Twitter. 11. B2B marketers say that their greatest barriers to lead generation success are the lack of resources in staffing, budgeting, or time. 12. Nearly 50% of B2B marketers’ lead gen budgets will increase this year, compared to 44% that will remain the same and 7% that will decrease. 13. 71% of B2B marketers use content marketing to generate leads. 14. People are more likely to visit a B2B tech company’s website after seeing a tweet from the company, getting them one step closer to becoming a lead.